Nourishing Notes designs and prints a unique line of letterpress greeting cards and kitchen towels. Part of their signature style, each greeting card features a P.S. 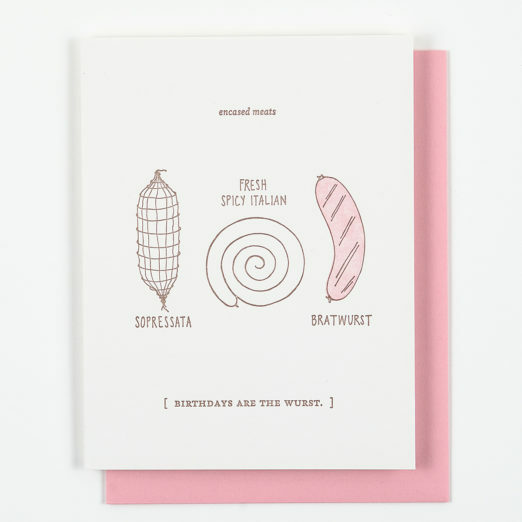 on the back - a tip (making mole), accompaniment suggestion (try these with creamy polenta) or factoid (see kiwi card). MFK Fisher, James Beard, Julia Child, Mark Bittman and Madhur Jaffrey. If you or someone you know lights up or reaches gleefully for the cast iron when you hear any of these names you are in good company with Nourishing Notes. Where the love of preparing and serving good food is as much about the radicchio and baguette as it is the people who gather round your table. Where does the inspiration for these fantastic cards come from? Check out one of Nourishing Notes' blog postsabout the passion behind the presses - letterpress and panini press that is. Stop in and see what's on our shelves for your favorite foodie! Give us a call or send us an email to check product availability. We have recently added Nourishing Notes' tea towel collection to our shelves. Delight the host with one of these, some brie and a bottle of Pinot.